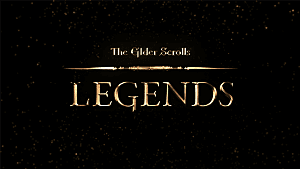 Throwing its hat into the collectible card game ring, Bethesda's Elder Scrolls Legends is now available in open beta, so it's time to build up that perfect deck and destroy a few friends online. 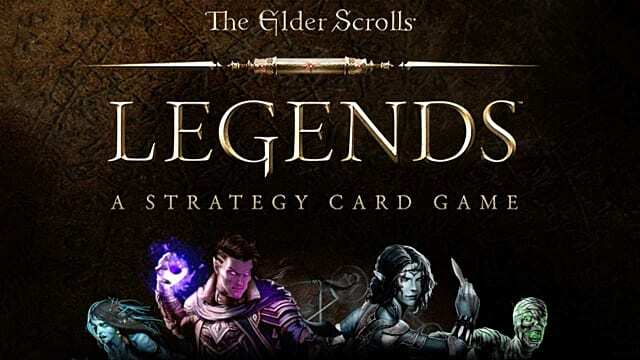 The question is still up in the air as to whether the full version will be the Hearthstone killer it's clearly trying to be, but for now Legends is an excellent entry in the online card game arena and well worth giving a shot. 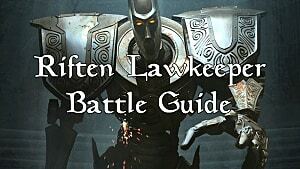 Before you put together a sloppy set of cards and make a fool of yourself trying to take on a polished High Elf life gain deck or an unassailable Endurance deck filled with huge creatures, there's a few strategies you'll want to learn first. 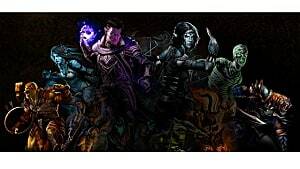 Specific "classes" are created by mashing together two different attributes for any given deck, like Intelligence and Strength meshed to create a Battlemage deck and so on. 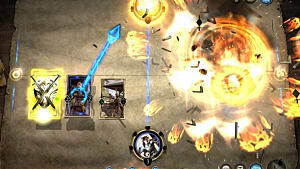 Once a match begins, the battlefield typically features a Field Lane and a Shadow Lane for placing your creatures. Each lane has a max number of creatures (usually four, but in same cases six if there's only a single lane due to changes in the match). Occasionally there are changes to the lane setup depending on your game mode, like creatures being automatically moved from one lane to the other at the end of a turn, or having to kill the creatures in one lane before being able to place anything in the next lane. 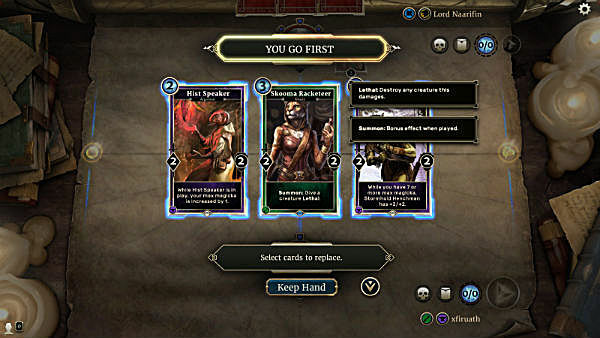 At the start of every match you get to see three cards for your hand and remove any of them if you wish to re-draw. While this is helpful for getting lower cost cards that can be used right away (or having a high cost trump card in reserve), there's another very important consideration when choosing your first draw: always get rid of your Prophecy cards. Unless they are low cost and you plan on putting them out in the first turn, its always a better idea to reshuffle any Prophecy cards so you have the possibility of playing them for free later. After shuffling and getting into a match, there's some specific card terminology and play mechanics to keep in mind for new players. Unlike most other card games, a card that summons another card (or places a card into your deck) does so out of thin air. In order words, you don't have to actually have that card in your deck – you just get it no matter what, so don't worry about finding the card in question and adding it to the deck. Unlike Magic: The Gathering, there's no straight blocking of creatures, and with (usually) two lanes you have to think in terms of a two-pronged battlefield rather than a simple free for all. The exception to this rule is the Guard ability, which forces creatures in a lane to attack the Guard before hitting an opponent directly. Something beefy with Guard in your deck is always helpful to give you time to get your combos going or pull out that behemoth creature, but don't ignore cheap cards that prevent specific enemies from attacking next turn with the Shackle ability. In most cases, simply throwing the best, most expensive cards into your deck is actually a recipe for failure. 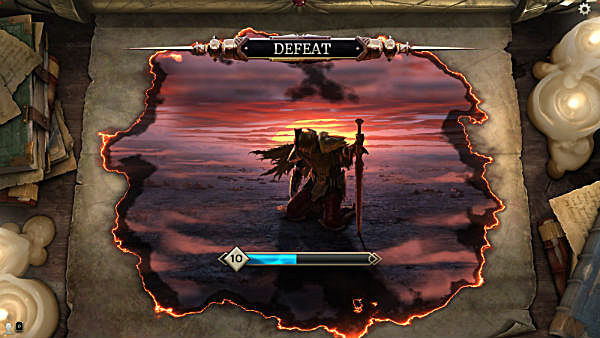 The story mode automatically does this for you after every level, beefing up your deck to a very unwieldy size with high-cost cards that don't actually work well together. Instead of going for everything and the kitchen sink, strive for synergy between cards. There's no point in putting the 5 cost Green-Touched Spriggan in your deck for instance if you don't have any other cards that let you gain health. The Spriggan is nearly useless as an overpriced 1/5 if you aren't pumping it by healing yourself. There's plenty of ways to make that card pump up to absurd levels very easily though, from packing your deck with creatures that have Drain to dualing into the Endurance cards and using lots of cheap heal options like Apprentice's Potion. 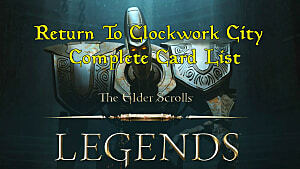 There are loads of other potential combos if you take some time to think out your deck ahead of time. Endurance card Trebuchet deals 4 damage randomly to any enemy at the start of the turn, which is useful, but can be made absolutely devastating in the right circumstances. 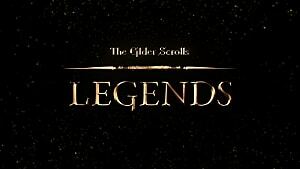 Consider what happens when you equip the 2 cost Daedric Dagger, which provides the Lethal ability. 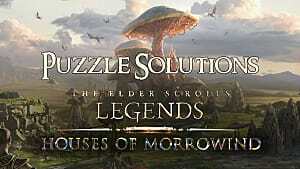 This ability works anytime a creature damages an enemy – even from a special ability, turning your Trebuchet from an annoyance that only damages big creatures to an absolute army killer. Sometimes the simplest combos can take down the biggest creatures. 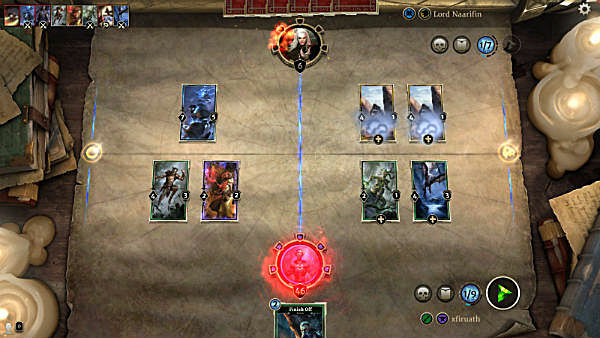 Arrow In The Knee mixed with Finish Off only costs 3 magicka, but can take down absolutely any creature that isn't Warded, no matter their defense score. Beyond combining cards, always try to think of methods for using cards in different ways than intended. For example, you may want to use the normally negative Silence effect on your own creatures, as it removes ALL effects, even bad ones like Shackle. 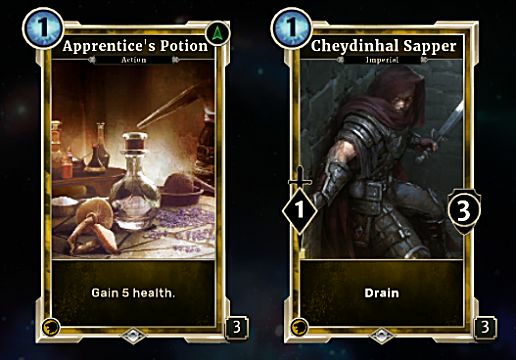 In their current state of the beta, some cards just aren't worth using, so always compare a card to other options in your deck that have the same magicka cost. Case in point: a non-upgraded Desaahn Sneak costs 4 to play and is only a 3/3 with no abilities. It's pointless to put that card in your deck when An-Xileel Invader costs the same but is a 5/3. Twilight Werebat is only a 4/3 for the same cost, but since it has Prophecy, its a better option than either of the previous two cards, as it may end up getting played for free just as your opponent thinks he's winning. On the opposite end, there are certain cards that are just straight up overpowered in comparison to other cards of the same cost – so use 'em know before they get patched. Haunting Spirit is a 3/3 that automatically gives another creature +3/+3 upon death, but somehow costs the same as any other 3/3 with no abilities. 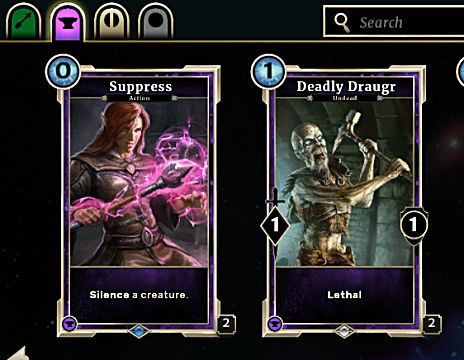 Deadly Draugr also has the Lethal ability for only 1 magicka, which is an excellent and very cheap way to take down a gigantic beefy monster. 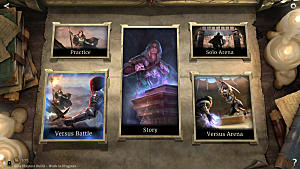 Keeping these Elder Scrolls Legends tips and tricks in mind, you're already on the way to absolutely destroying story mode and getting an impressive win record in multiplayer. That's not all there is to the game though - stay tuned as we cover specifics on how to dominate in the Arena and advanced strategies for remaining competitive in Versus matches.